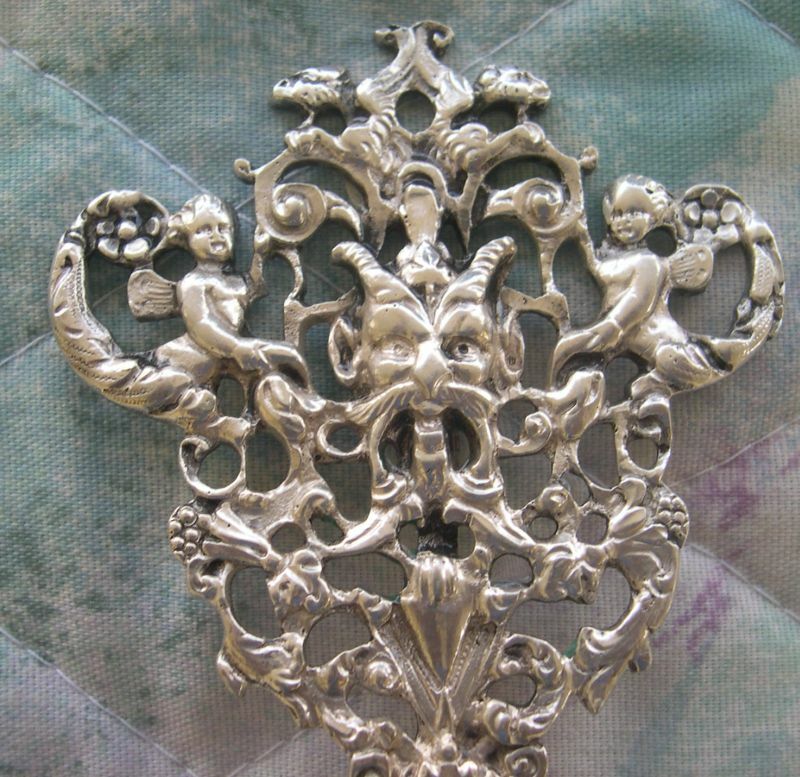 Representations of the Devil on silver are rare, as might be expected. 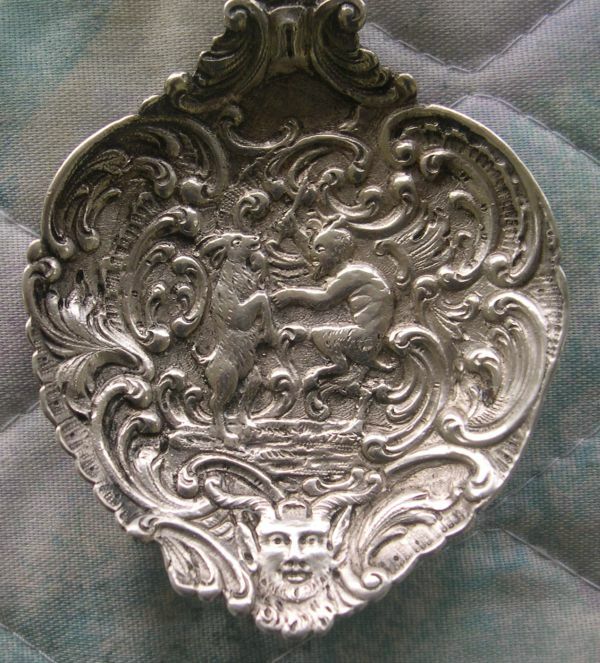 German or Dutch spoon depicting the devil or pan striking a goat surrounded by art nouveau design motifs. The face at the finial might be Jesus --but that is a guess. man on the top and as a goat on the bottom. The lower figure clearly has horns and is supposed to represent the devil. 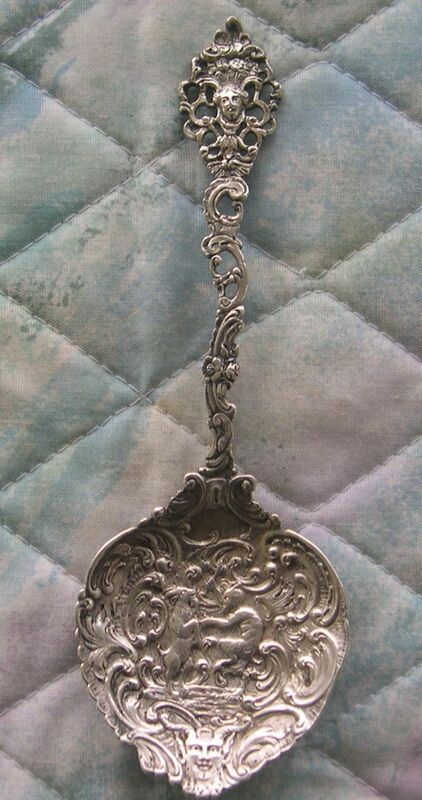 Pan is the goat-footed god of the Greeks and represents the shepards and wooded areas. He is also a capable musician who likes to dance with nymphs. He can drive people wild and is the source of our word 'panic'. There is also a sexual element to his personality. 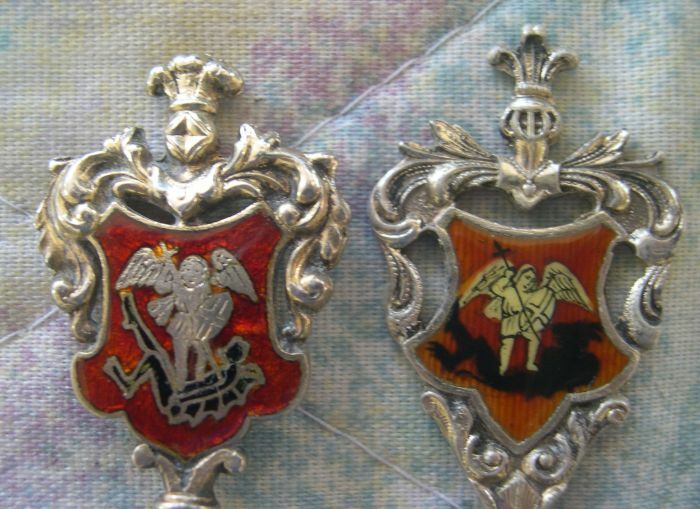 In most stories his father is Hermes and his mother was a nymph (although there are different stories available). The Roman name for this god is Faunus. This representation of the God Pan, who was half man and half goat was extensively worshipped in the ancient European world. Somehow, the hair and hoof of the goat became a talisman for protection from the devil, thus goats were lovingly nourished and well kept. Sailors once strongly believed that a goat skin would ensure a calm sea if hung from the mainmast. 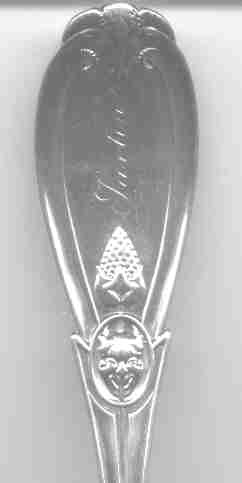 Spoon features the devil (see the horns) surrounded by two flying cherubs. I think that is his tonguesticking out below the mouth. In 1455 a gilded statue of St. Michael slaying the devil was put on top of the Brussels town hall tower. The original statue remained on the tower for 541 years until it was replaced in June 1996. The 310 foot gothic style tower was constructed by court architech Philip the Good.